If there’s one thing that Joss Whedon has done for Television, it’s incorporate fun into anything that he’s doing. Whether it’s Buffy, Angel, Firefly or Dollhouse, I’ve always found myself grinning like a loon during most series that he’s had a hand in. He’s got a talent for allowing the viewer to identify and empathise with his protagonists. When I heard that the all-knowing Joss was to be involved with The Avengers, I was ecstatic – I couldn’t think of anyone more perfect for the job, and the same can be said for my reaction to a new spin-off TV series based on the S.H.I.E.L.D organisation that shadows the Marvel Cinematic Universe at every turn. Marvel’s Agents Of S.H.I.E.L.D is the fruit of Sir Whedon’s efforts, and I’m happy to say that the initial impression the pilot has left me with is a resoundingly positive one. Firstoff let me just reassure you that there will be no spoilers in this “review” of the first episode – the show’s pilot aired in the US on Tuesday, and I’ve been lucky enough to use some proxy magic to allow me to view it ahead of today’s UK premiere on Channel 4 this evening (check out our guide on using proxies to get the most out of your Netflix account… you can use the same trick to view this). Taking place directly after the events of Iron Man 3, and referencing the events that unfolded in New York, Agents of Shield picks up following Agent Ward (Brett Dalton from Blue Bloods) – a young and impetuous agent that scores off the charts in every aspect of his work, bar people skills. He is assimilated into a new team headed-up by the assumed deceased Agent Coulson, played by the always amazing Clark Gregg. 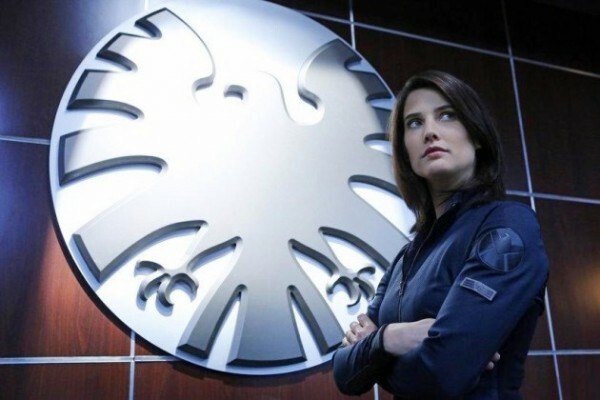 Another actor reprising their role is Cobie Smulders returning as Agent Maria Hill. I don’t want to go too much into the story, as with half-hour episodes there’s not much to discuss that wouldn’t ruin anything for you. Needless to say a new “super” is located, and Coulson’s team is tasked with containing and debriefing them, with a few hiccups and developments along the way. All the acting in the episode is verymuch Whedon-inspired, with some great in-jokes and one-liners that fit the tone and characters perfectly. You’ll see some returning Whedonverse regulars in the form of J. August Richards from Angel, and Ron Glass aka Shepherd Book from Firefly. They both turn in great performances in their respective roles, with Glass’ character potentially adding a twist to develop later on in the series. 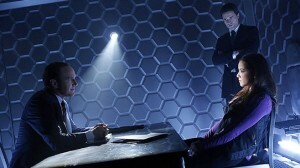 Agents Coulson and Ward interrogate a suspect. The production values are understandably high coming from Marvel, with great use of CGI and thankfully it’s not too fantastical, so everything seems a bit more grounded in reality. This works in the series’ favour in my opinion – we get to see the truly fantastic events from the show’s older cinematical brethren. Separating things slightly keeps the characters more real and easier to form emotional attachments with. Initially most of the screen-time is lent to Agents Ward and Coulson, developing their uneasy bond from the off, although the quirky Fitz and Simmons (Iain De Caestecker and Elizabeth Henstridge respectively) look like they’re going to be fun, and a good source of comic relief. The music in this episode is great, and this comes as no surprise to me as it’s done by the always exceptional Bear McCreary – the man responsible for the music in Battlestar Galactica and The Walking Dead. It fits the tone, and inspires the appropriate emotions at all the right moments. Although the storyline for this initial outing seems a little predictable from the start, I still found myself glued to the screen, with that same ridiculous grin on my face. I’d say the first episode is a gentle beginning into something that could develop into an absolute monster of a series, and I’m really looking forward to see how it develops. Agents of Shield is definitely going to be a series that starts off slow, and gets better and better – I’d highly recommend it, even moreso if you’re an existing MCU fan, as it will just help to bolster the universe that Joss Whedon and Mark Miller are creating.